As the holidays approach, kids are making their wish lists. For some a puppy might be a priority while others might want a doll. Since I prefer gifts that don't require walking, I'm giving my kids the Talking Anya Dress Up & Pet Puppies app for our Apple devices. My kids would love a puppy. Since I'm not ready to have another baby in the house, my compromise is this fun app. The puppy feature has all the fun of playing with a puppy without the mess. First users choose their dog and then the playing begins. In the app players can make them do tricks, including stand, spin, shake hands, fetch and crawl. After you share your love with them, the puppies will love you back. It's one of the most fun virtual pets that I've seen. For the little girls who like to play with dolls, Anya has tons to offer. The most impressive feature of this app is that Anya can mimic the user. The app has a voice recognition feature where Anya will repeat what you have said to her. Also, Anya reacts to several actions. From playing with her hair to playing the maracas, you can play with her on screen. It's like having a little friend on your iphone. Also, you can simultaneous play this game with a friend. When two iphones, both with the app, are close together, the players can play the games together. Some fun games are tossing a beach ball, hula hoop and popping bubbles. The single player game becomes a multi-player game in an instant. The latest version of the Talking Anya Dress Up and Pet Puppies app has fun holiday scenes. From Jingling Bells to fun holiday outfits, you can get into the holiday spirit with Anya. 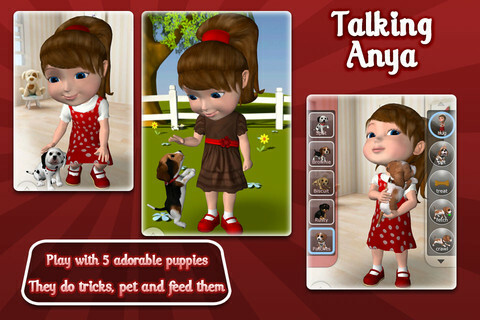 The Talking Anya Dress Up and Pet Puppies App is available at the iTunes app store. The app is available for both the iPhone and the iPad. It is free. 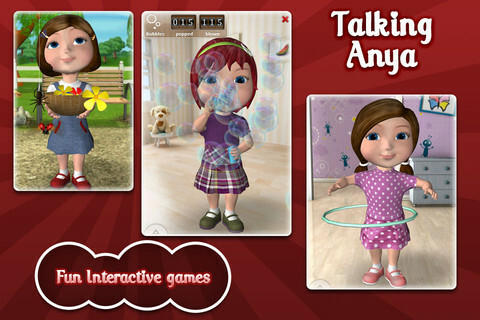 Give kids the imaginative fun of the Talking Anya Dress up and Pet Puppies app today. Disclosure: I wrote this post as part of a promotion. All opinions are my own.